As many of you know, the Lady’s Magazine project began as an effort to provide an annotated index of all of the text content of the Lady’s Magazine from 1770 to 1818. In addition to cataloguing every one of the around 15000 anecdotes, essays, serials and so on that the periodical printed during these years, we classified each of these items generically and provided keywords for every separate item in it to make its thousands of pages more easily navigable for modern readers and researchers. Additionally, we worked to identify source texts for the magazine’s reprinted and excerpted material (no mean feat since periodical editors in this era were usually coy, shall we say, about such matters) and we also tried to identify as many as we could of the magazine’s anonymous and pseudonymous contributors. We posted a number of our findings along the way on this blog, identifying the likes of the truly fascinating translator R. while also illuminating the careers of poets such as John Webb and fiction writers such as the Yeames sisters. 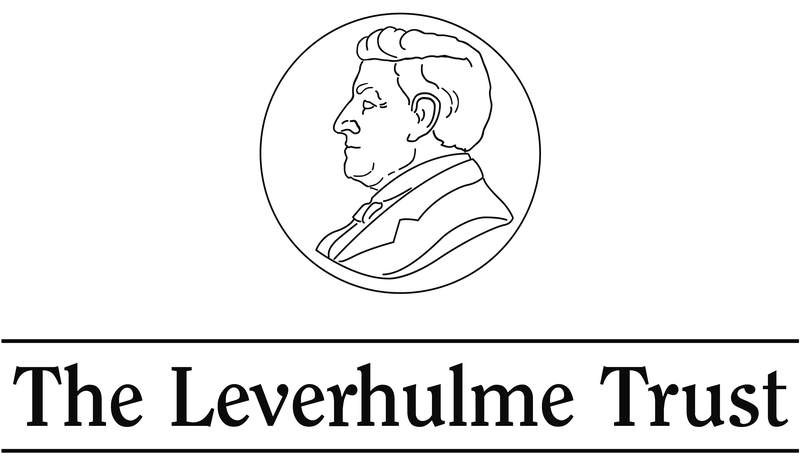 The indexing part of the project officially ended in 2016 with the end of our Leverhulme funded research project. But for me, this work is far from over. In recent months, I have given a paper on Radagunda Roberts and have written a journal article on Mary Pilkington and Catherine Day Haynes/Golland’s unacknowledged work for the Lady’s Magazine. I still haven’t given up on finding out more about gothic novelist Mrs Kendall either. But I really wasn’t intending to think about attribution earlier this week when doing further research for a small section of the book on the magazine I am writing on the many, often beautiful, illustrations the periodical published in its more than six decade run. I was simply refreshing my memory about the key figures – G. M. Brighty, James Heath, Charles Heath, H. Mutley and Thomas Stothard etc. – with whom the magazine’s publishers collaborated and whose engravings, frontispieces and fashion plates ‘elegantly embellished’ successive issues of the Lady’s Magazine. While doing this, I remembered a few occasions in the publication’s history where it didn’t have to commission engravings because contributors provided them with their copy. Once such case was in February 1784 when ‘P. 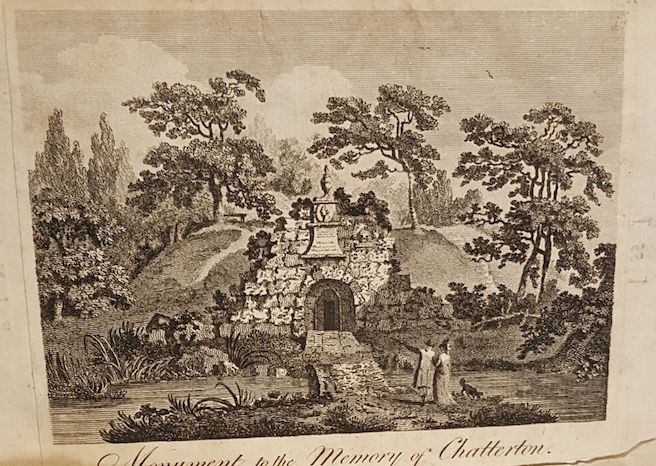 T.’ submitted a description of a monument raised in Bath to honour the poet Thomas Chatterton. It didn’t take much ingenuity to work out that P. T. lightly conceals the identity of Philip Thicknesse, the travel writer and compellingly eccentric (some might say dubious or downright obnoxious) figure in the grounds of whose home the ‘Mausoleum’ was built and under which he would intriguingly bury his sixteen-year-old daughter Ann Frances in late 1785. But even if ingenuity (and Google) had failed me, the magazine’s ‘Correspondents’ column left me in no doubt about the identity ‘P. T.’ Indeed, the editor went out of his way to ‘acknowledge’ his ‘obligation to Capt. Thicknesse, for the honour of the Embellishment for this month’s collection’. 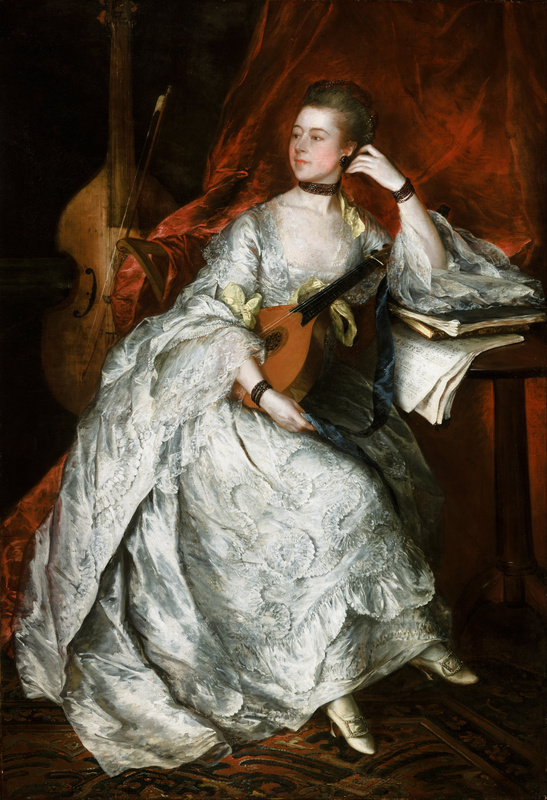 Thomas Gainsborough, ‘Ann Ford’ (later Mrs. Philip Thicknesse). Image: Wikimedia Commons. Ann Thicknesse (née Ford, 1737–1824) has interested me for some time. A talented musician and writer, she was known primarily to me as the author of the three-volume biographical dictionary, Sketches of the Lives and Writings of the Ladies of France (1778-81), from which the magazine reprinted a number of extracts in the early 1780s, and upon which Matilda Betham and Mary Hays drew in their own biographical works a few decades later. Thicknesse was much later the author of a now relatively obscure (and not desperately good ) novel entitled The School of Fashion (1800). I didn’t know a great deal about Thicknesse’s life, beyond the fact that it was long and that she had had to rebuff in print the taint of scandal as a young woman when Lord Jersey, a considerably older and married admirer, tried and failed to make her his mistress. In 1762, Ann became Philip Thicknesse’s third wife, months after the death of his second wife (and Ann’s close friend), Elizabeth. They would have several children together (quite how many is disputed) and were married for thirty years until Philip’s death in France in 1792 on the last of their many European travels together. Ann’s life and career are documented in various places including the Oxford Dictionary of National Biography and the indeispensible Orlando database of women writers in Britain. Both acknowledge that her writing career began in the 1760s with the publication of a staunch defence of her reputation in the face of Jersey’s allegations as well as two musical primers. A hiatus followed until the publication of Sketches in 1778, one that seems entirely natural given the amount of time Ann spent being pregnant, giving birth to and raising children in the next decade and a half. But the note in the Lady’s Magazine’s ‘Correspondents’ column about the work entitled ‘Advice to her Daughter’ indicated clearly that this hiatus might not have been as long as we had suspected, and that Thicknesse’s literary career might have pre-dated the publication of Sketches. But what was the ‘Advice’? I’ve long been intrigued by ‘Mrs. T-ss’s Advice to her daughter’, not least because of its worldly but conservative views on three of my favourite preoccupations: dress, masquerades and dancing, all of which, Mrs. T. pointed out, had the potential to make women ‘disgustful’ in the eyes of others. But Thicknesse’s more reactionary views sat alongside her deep-seated conviction in the potential of the female mind. Through-lines between her magazine conduct book and later Sketches become more apparent as the series unfolds and are plain to see in its penultimate installment from February 1776: ‘Women inferior to Men, owing to their wrong Education’. Of a mind with the magazine that published her manuscript, Thicknesse argued passionately here for female education. If women seemed ‘fantastical’ or ‘trifling’ then it was only because they were denied the same pedaogogical and life advantages that men had and not because of any innate frivolousness or intellectual inferiority. Women, she argued, were just ‘as capable of reason and deep reflection as men’ in a paragraph that lauded the examples of historian Catharine Macaulay and scholar Elizabeth Carter, to whom the first volume of Thicknesse’s Sketches would later be dedicated (89). ‘Mrs. 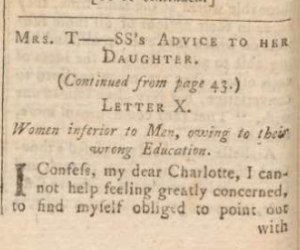 T-ss’s Advice to her daughter’ was not Thicknesse’s first published work but it was, arguably, her first recognizably literary work and now it has been identified as her work should be seen as an important precursor (literally and thematically) to her famous Sketches. Whether she wrote other original pieces for the Lady’s Magazine or other periodicals is not yet known. As I wonder how many other notable women writers published works we have yet to discover in the Lady’s Magazine and rival periodicals I realize that while the book I am writing will get written some time in the not too distant future, the Lady’s Magazine project will always feel open-ended for me. There is still, I feel, so much to find out and so much I want to know. This entry was posted in Uncategorized and tagged Ann Thicknesse, conduct books advice literaturee, lady's magazine, Philip Thicknesse, Thomas Chatterton on June 30, 2018 by ladys-magazine. Many of the Lady’s Magazine project’s followers do so because they are interested in fashion. That’s hardly surprising, really. The periodical’s fashion plates, reports, embroidery patterns and the many hundreds of essays it published on the allure and perils of sartorial consumption are the very things that first brought me to the Lady’s Magazine as a PhD student writing on eighteenth-century dress back in the late 1990s. 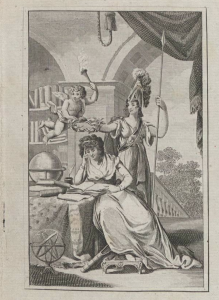 From its very first issue in August 1770 the periodical signalled that regular ‘fashion intelligence’ in the form of engravings and written descriptions of ‘the covering of the head, or the clothing of the body’ would be an indispensible part of its format (1). It was, though, a promise the magazine struggled to made good on. Although those essays on dress, as well as attention to the costumes of other nations in travel writing and an antiquarian interest in dress in works of history, are recurrent features in the periodical from its inception, fashion journalism, as we would call it now, is conspicuously absent in the magazine in its first thirty years. LM 1 (Nov 1770). Image © Adam Matthew Digital / Birmingham Central Library. Not to be reproduced without permission. 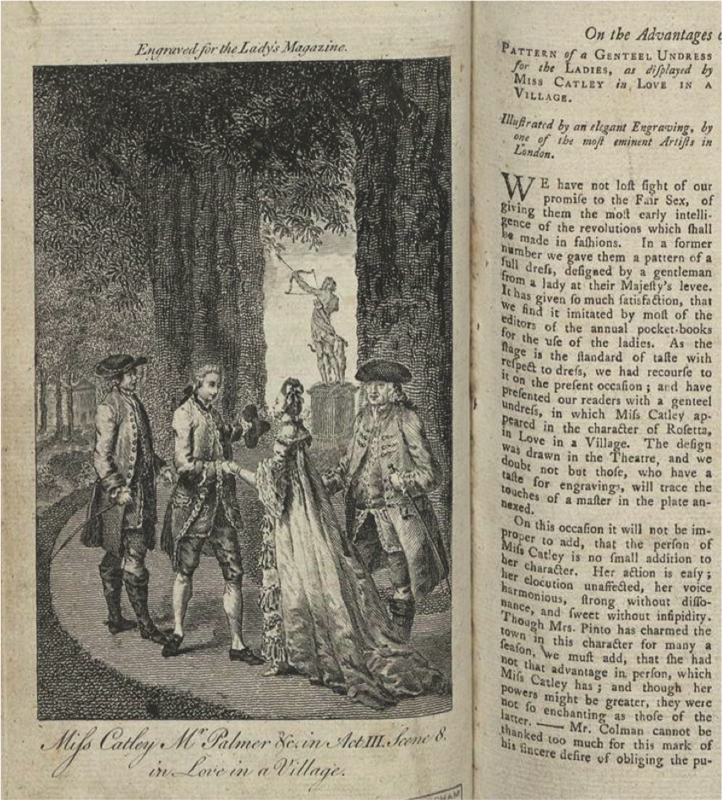 The first fashion report, of sorts, the magazine published was in November 1770 and was accompanied by an engraving showing the actress Ann Catley in a scene from Love in a Village. In it, the magazine’s editors remarked that they had not lost sight of their promise to provide readers with the latest trends, but they struggled to live up to their stated objective of purveying metropolitan fashions to those in the provinces in subsequent issues (170). The first recognisably modern fashion report was not published until February 1773 and is typical of the economical to the point of obscurity, staccato prose style that would characterise the genre at this time: ‘The hair in front, with small puff curls; a close cap, made with wings; narrow ribbon, in small puffs; double row of lace; ditto lapelled …’ (72). Next month the magazine followed with an account of full dress and undress for March, allowing the unknown author to make comparisons that suggested fashion’s progress, even month by month, would be bewilderingly relentless – ‘Hair front lower, puff curls or none …’ – without the guiding hand of the magazine to steer readers through its labyrinthine course (152). The magazine’s fashion reporters were as impermanent as the quickly outmoded styles they described, however, and readers wanting to know if hair fronts would plunge lower still (gasp!) would have to wait until September for the next update, and thereafter for another four issues until the Supplement to learn more. The problem got a good deal worse before it got better. A contributor known as Charlotte Stanley was by far the most reliable of these figures, although that’s not saying much. Her career of fashion reporting for the magazine began in March 1774; she produced another three reports across the rest of the year but did not resume her column until March 1776 (after the magazine apparently received a barrage of complaints from readers). She would produce only one more report that year. In 1777 and 1778 no fashion reports appeared in the magazine at all, but readers would not let the matter lie. As late as June 1782, a regular contributor to the magazine, Henrietta C-p-r, was begging Miss Stanley to once again bestow her ‘elegant favours’ upon her readers. The request fell on deaf ears. In fact, it was not until the 1790s that fashion reports (usually glancing over the channel to observe the shifting styles, as well as politics, in France), became a much more regular feature. 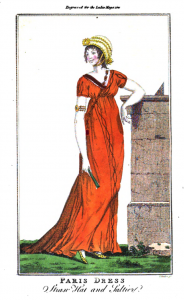 In 1800 would they become a permanent monthly fixture with the introduction of an elegant coloured fashion plate of Paris fashions usually taken (unacknowledged) from Le Journal des Dames et des Modes (1797–1839). (I’ve had a lot of fun playing ‘find the fashion plate’ in the past few weeks.) London reports and plates, commissioned directly by the magazine, did not follow until 1805. Before the first decade of the nineteenth century, fashion plates were an at best an irregular feature, largely it seems, because of the expence they involved. But it was an expence that could not be avoided after the founding on Vernor and Hood’s pocket-sized and elegant rival, the Lady’s Monthly Museum (1798–1828), with which the Lady’s would later merge and which contained monthly coloured plates. In a bid to keep up with its new and unwelcome competitor the Lady’s Magazine raised its price from the sixpence it had charged for thirty years to a shilling an issue in part to cover the costs of fashion plates. Both publications faced further fashion competition from the launch of John Bell’s sumptuous, royal octavo La Belle Assemblée, or Belle’s Court and Fashionable Magazine, which launched in February 1806 and also later merged with the Lady’s. Bell’s magazine carried rich and varied contents, but remains best known for its dedicated and substantial, multi-page monthly fashion section originally entitled the ‘Second Division’. In the first issue alone this section included: reports on ‘London Fashions for the Present Month’; ‘Parisian Fashions, for February’; ‘General Observations on Fashions and the Fashionables’; ‘Three whole length Portraits, and four Head Dresses of the London Fashions’; ‘Five whole length Portraits of Parisian Fashions’; and four embroidery patterns. None of the fashion plates was coloured, but this would change just ten months later when, in response to competition from his son John Browne Bell’s Le Beau Mode, and Monthly Register (1806–9), Bell Senior offered La Belle Assemblée in two formats: 2s 6d for issues containing uncoloured engravings, and 3s and 6d for those with coloured fashion plates. LM 58 (Nov 1827). Image © Adam Matthew Digital / Cambridge University Library. Not to be reproduced without permission. The Lady’s Magazine could never compete fully with the high production values of Bell’s periodical, which even at its lowest price point cost twice as much as George Robsinson’s monthly magazine. But La Belle Assemblée’s influence can nevertheless be felt in the Lady’s Magazine’s and Lady’s Monthly Museum’s fashion coverage. One of its most important developments was its emphasis upon named fashion authorities, a trend that Rudolf Ackermann’s Repository of Arts (1809–29) also followed. Professional dressmakers and milliners such as Madame (Margaret) Lanchester and then Mrs M. A. (Mary Ann) Bell featured prominently as the ‘inventresses’ of the fashions La Belle Assemblée and the Repository visualised and described, while advertisements for these women’s fashionable London establishments featured in their back pages. 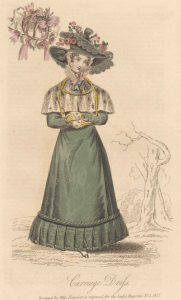 By the 1810s, the Lady’s Monthly Museum and Lady’s Magazine had followed suit by looking to their own fashionistas – Miss Macdonald of 50 South Molton Street, Mrs W. Smith of 15 Old Burlington Street and Miss (Mary Maria) Pierpoint of Portman Square – to provide direction on the latest styles with instructions. The reliance upon the expertise of these women changed the magazine’s fashion content in various ways that I have been trying to think through and write about in a book I am working on about the Lady’s Magazine. I’ve now worked out what I want to say about that, but as I was mulling it over and pondering the way the magazine’s fashion content changed over time, I couldn’t stop thinking about Madame Lanchester, Mrs Bell – interchangeably referred to in various sources as John Bell’s wife or daughter-in-law – and Miss Pierpoint. Who were these women? Why do we know so little about them now when in their own day their name commanded such widespread respect from the fashion conscious readers of the Lady’s Magazine and its competitors? I don’t yet have all the answers and there is much more I hope to be able to find out about these women, but after many hours (confession: it might actually be days) diving into the newspapers and digging around on Ancestry, I know a good deal more than I did and I plan to share some of these insights in part 2 of this blog post next week. Hope you’ll join me then! This entry was posted in Uncategorized and tagged Ackermann, dressmaking, embroidery patterns, fashion, fashion plates, La Bell Assemblee, lady's magazine, Lady's Monthly Museum, millinery, Mrs Bell, Mrs Lanchester, regency fashion, Repository of Arts on June 19, 2018 by ladys-magazine. Based on the news coverage, you would be forgiven for thinking that only Southey’s Remains of Henry Kirke White was saved from the briny deep in 1812. But this was not the case. 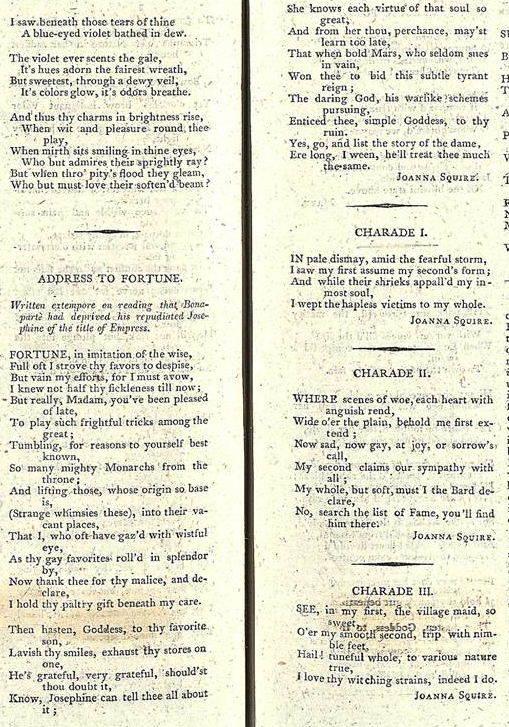 Especially prized by Charlotte Bronte was a set of volumes that kept the young woman away from her lessons and hungering after a literary career of her own: a collection of the Lady’s Magazine, the full run of which periodical extended well beyond the date of the shipwreck (from 1770 to 1832). LM XXVII (Jan 1797): 12-13. © Jennie Batchelor. Not to be reproduced without permission. 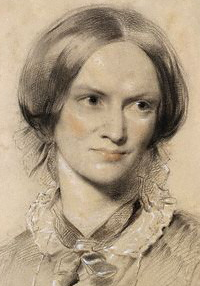 The sense of horror and betrayal of her father’s act was evidently very much alive to Bronte years after it had been committed and clearly ran as deep as her affection for a magazine and an associated writing culture – ‘when the Lady’s magazine was flourishing like a green bay tree’ – that she sorely lamented the loss of as an aspiring professional writer. But of course what is most interesting about this story is the tale of survival and destruction around which it turns and the complex psychodrama it plays out. For every fact the letter seems to give us – that Bronte read the Lady’s Magazine, that she associated it with the successful promotion of women’s writing, for instance – at least one question is begged – did she really think that unpaid journalism was preferable to a life of professional authorship and did she share any of her father’s views of its foolishness, for example. Most insistently, however, the question that nags at the reader of the letter is this: How could Patrick Bronte destroy volumes that evidently meant so much to his daughter and which had been saved, along with the Southey, from the waves? 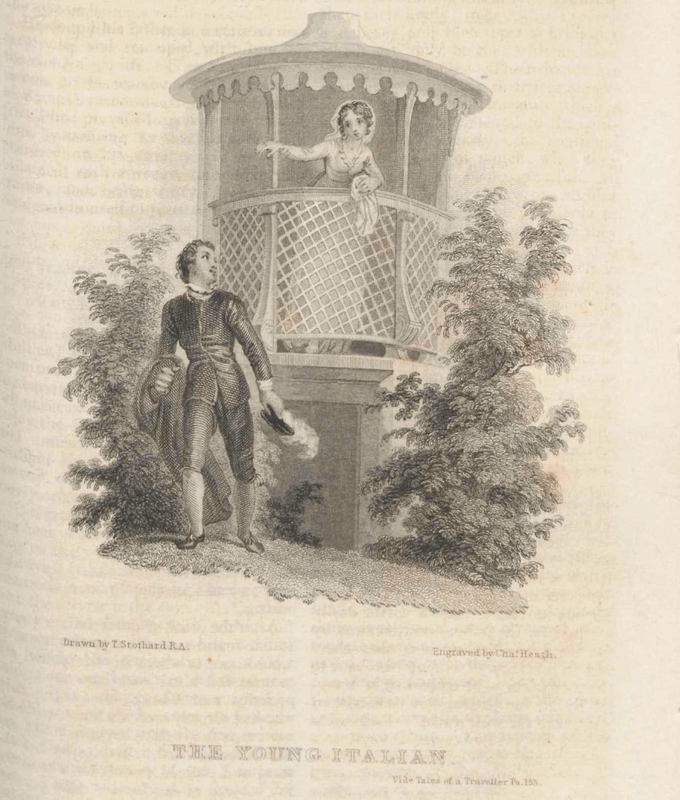 In many ways, I feel that the broader piece of research to which our current Leverhulme project is related – a book I am writing about the Lady’s Magazine‘s place in Romantic literature and culture – is an attempt to answer this question. 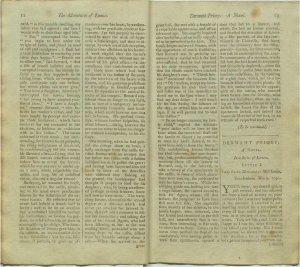 The rage, which is at once unique to the Bronte family and yet also eerily emblematic of the fate of the Lady’s Magazine, one of the most successful women’s magazines of all times and yet all but silenced in literary history, would certainly take many more words to explain than I have in this blog post. For now though, I am struck by something I had lost sight of until the news stories of the past week or so. The Bronte Parsonage Museum’s acquisition of Maria Bronte’s copy of what has been repeatedly described as the treasured and invaluable Remains of Henry Kirke White reminds me that what is most important and too often forgotten is that the Lady’s Magazine was valued enough to be saved. Not only that but it was valued enough by at least one of Maria Bronte’s daughters enough to be read, re-read and remembered. The story of the destruction of copies of The Lady’s Magazine by a man who likely never read it (it was far more cynical about love than foolish) should not mute the more triumphant and arguably more telling one about its survival against the odds. These volumes will never be returned to Haworth, but given the personal and, I would argue, textual legacies that the magazine undoubtedly bestowed Charlotte Bronte, they never really left there. Prior to her marriage to Patrick Bronte, Maria sent for her possessions to be shipped from Penzance, but the vessel ran aground of the Devonshire coast en route. The Letters of Charlotte Bronte: Vol. 1, 1829-1847, ed Margaret Smith (Oxford: Clarendon Press, 1995), p. 240. This entry was posted in Uncategorized on July 28, 2016 by ladys-magazine. 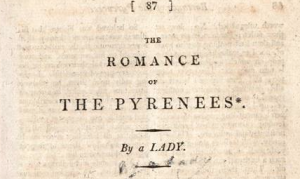 Working on The Lady’s Magazine project this May and June has led me down all manner of bizarre eighteenth-century rabbit holes, and no two days are ever the same. I have, over the month, chased one of Mary Robinson’s stray Sylphids across numerous newspapers. I found myself reading about sheep rot in an agricultural magazine just yesterday. I encountered a very serious vicar (J. H. Prince) who, as well as reflections on suicide, also wrote odes on dead cats (there are a surprising number of these, from a surprising number of contributors, in the magazine). 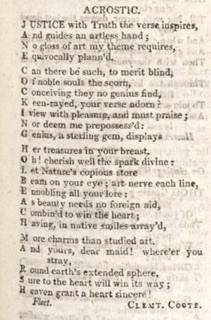 I caught a brief glimpse of Emma Hamilton, or someone posing as her, in the pages of 1800, waxing lyrical about reading Dimond’s petrarchal sonnets. I smiled as the same hopeless swain, writing hopeless lines of poetry, tried with his lays first to ensnare one Susan Yates, and then just two months later, a Sophia. I laughed at Dr Hawes’ recommended methods for restoring to life the apparently dead (‘what thou doest – do quickly’), and laughed even more as ‘Tommy Softchin’ bemoaned his lack of whiskers. Sometimes I got very carried away on Ancestry; I tracked down the son of one of the magazine’s long-term contributors, John Webb. Webb often wrote poetry about his sons, and this particular one, Conrade, had a ‘providential escape’ from death by cart in 1800. This escape proved fortunate for him, obviously, but unfortunate for 18 year-old William Riddle, who, 33 years later, was sentenced to two month’s confinement for drunkenly stealing a ham from his master, a cheesemonger: Conrade Manger Webb. Reading the Old Bailey Records, I thought about the ‘playful Conrade’ that a charmed father wrote about, the suing cheesemonger of 1833, and the 77-year-old man who lived and died on Edgware Road, weaving together these three seemingly disparate images, these three traces of a real, lived life. The paucity of biographical records from this period often sees lives squashed into stubborn, unyielding signifiers. The thrill of finding the right person is quickly overwritten by frustration as that person is reduced to a date of birth, marriage, death, or a street number. Sometimes the records give a bit more: a court appearance, a list of household residents, a photo of a document. But I found over the last few months, that the magazine contributions themselves could sometimes provide rich insights into the lives of the contributors. In other words, they can make the records speak to us. My work on the project was on attribution and authorship. I donned my best detective hat and ploughed my way through the years, cross-referencing each entry to find out whether it was original; if not, where it came from; and in any case, who might have written it. Tracking down an unacknowledged appropriation has its own pleasures, particularly when the search is a long, piecemeal one, but the most rewarding (and the most potentially frustrating) work lies, I think, in attribution. The magazine is a wonderful, dense, and unruly site in which to perform recovery project archaeology. Although there are so many contributors who will probably never be traced (the Eleanor H**** who translated 6 plays from French and German between 1799 and 1805 proved just one source of frustration for me this month), some are just waiting to be discovered. Likewise, although many contributors had short-lived careers in the Lady’s Magazine, some went on to publish novels or poetry collections after. Others can tell us something about their particular historical moment, about their situated and personal experiences. As Jennie noted in a recent blogpost, recovering the lives of contributors ‘might not seem all that important beyond fleshing out a footnote in literary history. 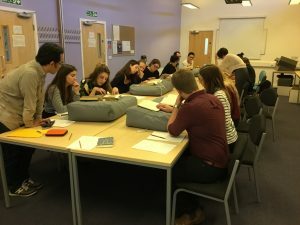 But for [each writer] we find, we are able to bring into slightly sharper focus what it might have meant to be an author in the period covered by the Lady’s Magazine.’ Indeed, the aim is to uncover a messy eighteenth-century that is sometimes overlooked in favour of clean, linear narratives. The magazine is the perfect forum for this sort of work: inclusive, democratic, dialogic. And it affords fascinating glimpses into lost lives, which speak to modern concerns as much as they did to the concerns of their many eighteenth- and nineteenth-century readers. LM 31 (Aug 1800): 439. mage © Adam Matthew Digital / British Library. Not to be reproduced without permission. And there she was. Jane Cocking, Holbeach Marsh. Right after an acrostic to her sister Anne Cocking. I had a lead, and Ancestry was forthcoming. Jane was born in Lincolnshire on 14th June 1789 to William (1760-1820) and Ann (nee Worseley, 1750-1834) Cocking. Her sister, Ann(e) (spelling varies in the records), was four years older than her (b. 7th March 1785). They lived at Holbeach Marsh, a fenland area in the South Holland district of Lincolnshire, which is where Jane signed most of her poetry from. And leave thee, ah! leave thee behind! Thou wilt e’er have a place in my mind. I’ve hail’d thee the charmingest scene. I shall ne’er see thy beauties again. These are clumsy and perhaps derivative poems, but they also tell us the story of a contributor that is wholly relatable to anyone who was once a teenage girl, who tried to imitate what she read, who had heartfelt hopes for her loved ones, or who had to move home as a child. ‘Tis a period, we’re told, ‘that’s no-where to be found. In July, Jane heeds her own advice, and leaves off thinking about leaving, in order to respond to a poem written by James Murray Lacey. His ‘Lover’s List’ establishes him as the Lady’s Magazine’s very own, eighteenth-century version of Lou Bega (see the questionable 1990 hit single Mambo No. 5), cataloguing his adoration of Evelina, then Mary, then Selina, then Betsy, then Nancy, and so on: 32 named women and ‘fifty more’ that he cannot name. Jane’s witty response in July reworks the original poem from a female respective, listing a slightly more modest 10 lovers, and ending with a flirtatious address to the original author: ‘I never will desert this swain [Francis is the one she’s settled on], / I do him love so well; /No, no, I’ll never change again – / Except for J. M. L.
But now I’m certain I am caught. His request that she ‘turn Francis off’ and write back to him sadly went answered. Meanwhile, we find out where Jane is actually going from another contributor, Belinda, who, in June 1805 writes two poems: ‘Lines to Miss Jane C—k—g’ and ‘Lines to the Misses C—k—g, on their going to America.’ From Belinda’s other poetry, alongside poems written to her, I was able to establish that her real name was Mary, and she had a sister who was probably called Ann. The final stanza of ‘on their going to America’ is intriguing. Belinda writes: ‘‘Tis a prayer that proceeds from the heart, / Although by a stranger ‘tis penned: / With regret she will hear you depart; / Then what pangs ‘twill inflict on each friend!’ Whilst these lines suggest that was wasn’t known to Jane personally, Jane’s response suggests that they were actually close friends. This is perhaps then demonstrative of the ways in which, like modern internet forums, the Lady’s Magazine provided a space in which to make ‘virtual’ friends. More likely, I think, given that Belinda writes from Fleet, near where Jane lived, it demonstrates the writer’s dogged adherence to the pseudonymity of the poem. Whilst Mary knows Jane, Belinda does not. Jane’s poetry dominated the section in April, and then in October, although the poems included in October’s issue were written between May and August. From Holbeach Marsh, she writes praising Belinda (Mary). She also writes a short poem on contentment; one on modesty, addressed to a Mr. W—ley; one entitled ‘The Forsaken Swain’; and an acrostic to Clement Coote, who had written acrostics to Jane and Anne in the magazine two months before. Coote, if he is the Clement Tubbs Coote that I tracked down, was christened in November 1784 in Cambridge, and so would have been close in age to Anne Cocking. In 1799, aged around 15, he was apprenticed to Charles Burnett, a grocer, in Fleet, Lincoln. Clement T. Coote is apprenticed to Charles Burnett, grocer. Aug 1799. He signs his 1805 poems from Fleet, as Belinda does, suggesting that this is how he knew Anne and Jane (Fleet is about 8 miles from Holbeach). In 1807, Coote returned to Cambridge, apparently giving up poetry, to take up another apprenticeship. Clement Coote is apprenticed to William Cockett, draper. Dec 1807. In 1809, he married Mary Cole, who I spent an inordinately long amount of time trying to prove was Belinda in the hopes of a nice tidy circle, but alas, no such luck. 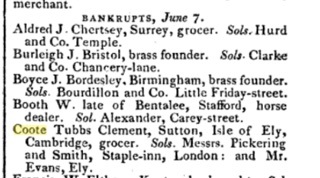 He went on to run a business as a draper, grocer and tallow-chaundler, but unfortunately went bankrupt in 1817. At some point shortly after this, the Coote family moved to America too, arriving in Philadelphia. Clement Coote died in Baltimore in 1849. A cheerless damp throughout my frame I feel. ‘Cheerless damp’ is the same phrase that Belinda uses in her 1806 poem ‘To a friend leaving the country.’ On September 12th 1805, Jane’s sister Anne married William Blanchard at St George in the East, in London. Then sometime over the next few weeks, Jane’s parents, Jane, and the newly married Anne and William all emigrated to America, where they settled in Washington, in the District of Columbia. Atlantic, be proud of thy charge! Neptune, curb ev’ry boist’rous storm! Let nought thy smooth bosom deform! And indeed, shipwrecks were a real threat. A list of all the shipwrecks in 1806, which is in the hundreds, can be found here. Unless I can track down Jane writing in America, it is unlikely that we will ever know what her journey was like or why her family travelled 3,000 miles to start again in Washington. However, they arrived safely. Life went on. On August 19th 1813, aged 24, Jane married an American called Charles Carroll Glover. They remained in Washington, appearing on the 1820 federal census with three children and – something that shocked me, and that might tell us a bit more about the Cockings’ economic status – two young female slaves. Suddenly the weaving of strands that I already thought I knew became harder; the coherent, imagined, and celebratory picture I’d created was fragmented. Jane’s sister Anne (now Blanchard) also remained in Washington, had a large family of six(?) children, and owned at least one slave in 1830. Around this time, the number of slaves in Washington had reached its peak, representing twelve percent of the city’s population. Anne shows up in 1862 claiming compensation for two recently freed slaves, Rachel Jackson and William Henry Taylor. You can view her petition here. Jane was widowed in 1827, and outlived all of her children too: her daughter Adeline died at 9 months; and sons William at 21, and Richard at 29. Jane herself lived to the grand age of 87, dying on September 14th, 1876. Gravestones at Oak Hill Cemetery, Washington, District of Columbia. From left to right: Charles and Jane Glover; Charles and Jane Glover’s children; Anne Cocking (Blanchard). Back in 1805, Clement Coote wrote a poem for Jane, ‘on her Arrival in London, just before her Departure for America’, but this wasn’t published until April 1806. In it, he hopes: ‘May you upon Columbia’s plain / Find some who love the tuneful train’, and wishes that she will continue to be inspired by other poets to write. Whether she did or not remains to be seen, and checking some American periodicals for Jane Cockings or Jane Glovers is on the to do list. Tracing Jane C—k—g did several things for me. It demonstrated the way in which the Lady’s Magazine functioned as a forum for communication between momentary, geographically-located, networks of friends. It gave me an insight into the materials available for a teenage girl to express her joys and her anxieties, her love of the countryside she grew up in, and her fears about leaving it for America. It suggested, in linking a village in Lincolnshire to the changing legal status of slaves in mid nineteenth-century America, that the magazine’s webs and networks can be extended to cover a huge variety of geographical spaces and historical issues, of which migration and globalisation formed an integral part. This month has been a profoundly odd one, but also a profoundly human one, in which the connections between the past and the present have at once been fractured – sheep rot seems inescapably alien to me, writing in 21st century London – but also maintained. We continue, as people, to be fragmented across our daily lives, our writing, the records we leave, even the thoughts we have. Reading Jane – at once anxious, sorrowful, optimistic, virtuous, flirtatious; a child writing juvenilia and a slave owner; an intrepid teenage voyager and a widowed mother – was a palpable reminder of this. This entry was posted in Uncategorized on June 22, 2016 by ladys-magazine. 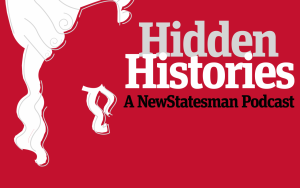 A couple of months ago, I was invited by Dr Sophie Coulombeau (Cardiff University) and Dr Liz Edwards (University of Wales) to take part in 3 of a series of 6 podcasts on eighteenth-century women writers and and how both got written out of literary history for the New Statesman. The Lady’s Magazine features prominently in two of the six podcasts: episode 4, ‘Sociable Spaces’ is about the magazine and the debating societies it tracked and mirrored for some of its history; and my ‘Fight Club’ pitch in episode 5 for the best woman writer of the eighteenth century was heavily influenced by her work on the magazine. The series as a whole is simply excellent and I had a ball being involved. The podcasts are free to listen to and download here. When Catherine Curzon, aka the fabulous Madame Gilflurt asked me if I would like to write something about the magazine for her wonderful blog, I jumped at the chance. I offered Catherine a few possible topics but was delighted when she picked the one I was hoping she would because it is a bit of a favourite of mine: the rotten state of marriage as it is portrayed in the magazine. You can read the blog post, which is much more fun than it sounds, I promise, here. 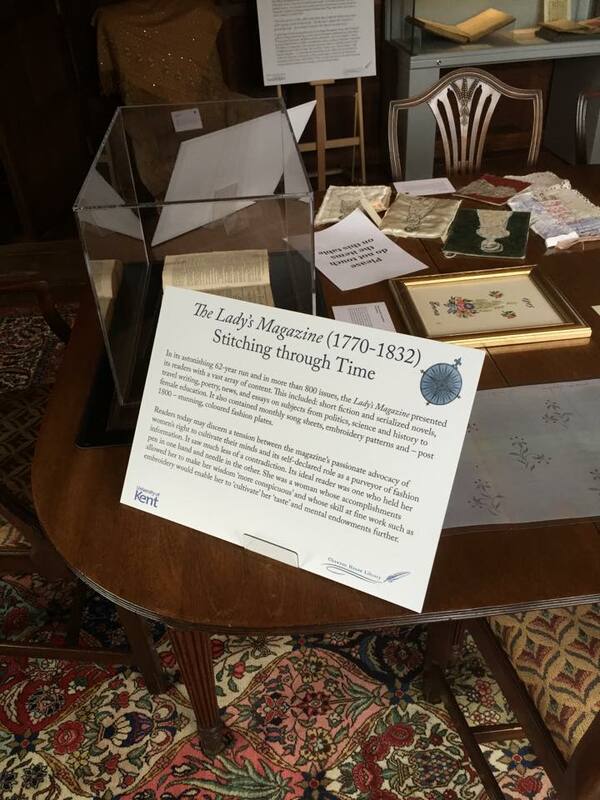 The Stitch Off continues apace, with new items arriving each week and comments from visitors pouring in to tell us how much they admire and are inspired by the wonderful exhibition of our followers’ work on display at Chawton House Library, as part of their ‘Emma at 200′ exhibition. I have said it before, but honestly, the Stitch Off is one of the most enjoyable projects I have ever been, and likely ever will be, involved in in my working life. So you can imagine how I felt when I was asked by the Editor of The Quilter if I would write something about how it all came about for their summer 2016 issue (number 147). I received my hard copy of the magazine last week, and it now takes pride of place on my coffee table at work. If you would like to read the article, you can find it here. I’d love to hear your thoughts about the article, blog post or podcast! This entry was posted in Uncategorized on June 16, 2016 by ladys-magazine. As we enter the last few months (gulp!) of our project, new discoveries are throwing themselves at us at a pretty alarming rate. A number of these insights relate to the identities and biographies of some of our authors. The emphasis here, as always, is on the some. We have noted this many times on this blog before, but it bears repeating: the vast majority of reader-contributors who provided original content for the magazine are, and will likely always remain, unknown to us, hidden as they are behind obscure pseudonyms or legal names so common that a week lost in Ancestry trying to find them will never be gotten back. The figures we have been able to piece biographical details about generally present themselves to us with a little bit of extra detail extra to help us on our attribution way. Often, as in the case of John and Elizabeth Legg or John Webb, this detail takes the form of a place of residence that, along with other clues, has taken us to the relevant archives. Some, like Elizabeth Yeames or C. D. Haynes, are betrayed by brief biographical nuggets offered up in the magazine itself or by easily overlooked asides in that most fabulous resource for the doggedly persistent academic, Notes and Queries. Others are located by pure serendipity. One such happy accident occurred a few months ago when I was too tired to do ‘proper work’ but unable to sleep. I was messing about on Ancestry and thinking about those magazine contributors I most wanted to know about but didn’t. LM, 60 (Dec 1809): 549. Image © Adam Matthew Digital / British Library. Not to be reproduced without permission. The name of Joanna Squire, or Miss Joanna Squire, as the magazine demurely referred to her, kept resurfacing in my mind. Joanna Squire enjoyed (although as you’ll see, that might not be quite the right word) quite a stint in the Lady’s Magazine. 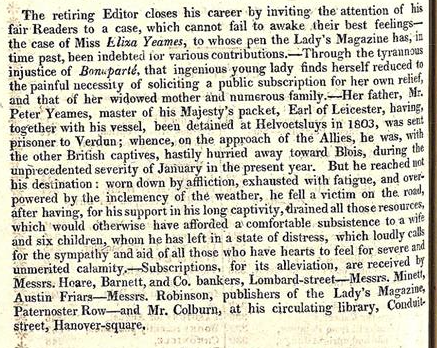 Although her nearly 6 years of publishing with the magazine (between late 1809 and 1815) is not remarkable by the periodical’s standards, the column inches she occupied were significant. 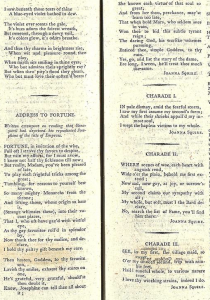 In addition to a sole piece of prose – a fragment on hope that appeared in the December 1809 issue – Squire produced a considerable number of poetic works in the first half of the 1810s. Indeed, many single monthly issues of the magazine from these years usually contains 4 or more of her poems. LM 61 (Oct 1810): 470-71. It was not Squire’s productivity that most impressed me, however; it was her range and spirit. Squire’s poems include completions of ’bouts-rimés’ (poems prompted by rhyming end lines offered up by the magazine to inspire readers), charades and meditations on the fickleness of fortune (a favourite topic). She often wrote poems to and received poetic epistles from other magazine contributors (including Charlotte Caroline Richardson and James Murray Lacey). She was also a patriotic and political poet who wrote a series of works condemning Bonaparte’s public and private life. Her ‘Address to Fortune’, an extempore poem on ‘reading that Bonaparte had deprived his repudiated Josephine of the title of Empress’ from the October 1810 issue, merits a blog post of its own. Yet this is just one of many poems Squire submitted to the Lady’s Magazine for publication and she remained their ‘respected’ and ‘ingenious’ correspondent, as they were apt to call her, for a significant period of time. At least, that is, until she spectacularly fell out with the magazine’s editors. 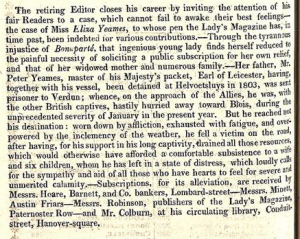 For the curious, Mrs Caveat – a figure in a regular serial in the magazine in the 1810s – admonishes a companion for want of ‘good breeding’ and ‘petulant’ comments on page 73. I bet you could have guessed that. From then on, Squire disappears from the Lady’s Magazine and although I had found other works by her in contemporary periodicals, I was drawing a blank in finding her or anything by her after 1815. What happened to her and her talent, I wondered? Had she died not long after the spat with the magazine? I had looked for her in birth, marriages and deaths records before, but had never found a convincing lead. But that evening my tired and inaccurately typing fingers happened upon a one I hadn’t found before: a Joanna Squires christened on 10 November 1776 in Staines Middlesex. As with my previous efforts to locate Catherine Cuthbertson, I hoped that Squire(s) had lived long enough to see the 1841 census so I could find out more about her and I also hoped that she was considerate and sensible enough not to have married. My initial and disappointed searches drew a blank. Then, just as I was about to give up, I thought I would try a marriage search again using the information in my new lead: a Joanna born around 1776 in Middlesex. When I found a marriage record for September 1816 to a John Carey in the parish of St George the Martyr, Southwark, I instantly woke up. I knew the name Carey. I knew that a John Carey (could it be this one? ), was a literary figure and I knew I had read excepts from his work and odd original pieces in the Lady’s Magazine. Before logging off from Ancestry I did a search for Joanna Carey in the 1841 and 1851 census returns hoping I might be on to something. I was. I found her: as Johanna Carey, a woman of independent means living in the same parish in which she married in 1841; and as Joanna Carey, now living with her servant Elizabeth Jones in Newington High Street, in 1851. From then it was a few internet searches to assemble a lot of biographical information very quickly. Dr John Carey was easy to pin down. A Dublin born classical scholar, teacher and editor, Carey has his own ODNB page , although no mention is made in it of either of his two wives (Joanna was the second). What the ODNB lacked, the Gentleman’s Magazine for 1830 more than made up for. Reporting Carey’s death on 8 December 1829 (the ODNB has Carey’s death date as 1826) in a substantial obituary, the Gentleman’s Magazine gives a generous account of Carey’s career, in part because he was a ‘frequent contributor’ to it himself. Gentleman’s Magazine, new series, 29 (April 1830): 371. 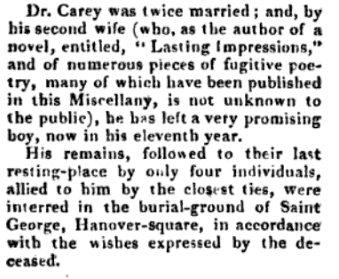 In the penultimate paragraph of the death notice, the obituarist notes that ‘Dr Carey was twice married; and, by his second wife (who, was the author of the novel, entitled “Lasting Impressions,” and of numerous pieces of fugitive poetry, many of which have been published in this Miscellany, is not unknown to the public), he has left a very promising boy, now in his eleventh year.’ John Squire Carey was born on the 29 August 1819 when his mother was in her early forties. He died in 1836 and his mother would outlive him for a further 15 years. When she died in November 1851, she left a will, witnessed by Elizabeth Jones, leaving her estate to her husband’s son from his previous marriage. Uncovering the details of Joanna Squire’s life might not seem all that important beyond fleshing out a footnote in literary history. But for every Joanna Squire, C. D. Haynes, Radagunda Roberts or John Legg we find, we are able to bring into slightly sharper focus what it might have meant to be an author in the period covered by the Lady’s Magazine. And the answer is a messy one. Authors for the Lady’s Magazine didn’t, usually, write in single genres or modes and their careers often spanned decades, marriages, childbirths and deaths. Known Lady’s Magazine authors often did not just write for this title. They fall into and out of love with the magazine as often as twenty-first-century scholars working on it. But thank goodness for serendipity for keeping even the most tired and cynical of researchers energised and keen to find out more. This entry was posted in Uncategorized on June 6, 2016 by ladys-magazine. While Trevelyan expressed admiration that Macaulay thought he could probably ‘rewrite “Sir Charles Grandison” from memory,’ his uncle’s passion for ‘silly, though readable’ books, like those of Mrs Meeke or Mrs Kitty Cuthbertson, who authored Santa Sebastiano, as well as The Romance of the Pyrenees (1803), The Forest of Montalbano (1810), Adelaide; or, the Countercharm (1813), and (although Trevelyan did not know this) Rosabella; or, A Mother’s Marriage (1817), seemed inexplicable. Yet Trevelyan’s view is unrepresentative. Kitty or Catherine Cuthbertson was a widely read and highly popular Gothic novelist in the Radcliffean tradition. The Romance of the Pyrenees was translated into French and German (the anonymous French translation was widely presumed to be of a Radcliffe novel on the continent). American editions of her novels followed and extracts from them appeared in US periodicals well into the nineteenth century . A perhaps still more telling indication of Cuthbertson’s enduring popular appeal can be found in a review of Lord Brabourne’s edition of Jane Austen’s letters that appeared in The Times on 6 February 1885. The review broadly welcomes Brabourne’s edition, but laments the lack of annotation, especially in correspondence in which Austen alludes to other writers. 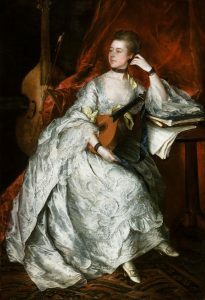 It was ‘absurd to assume’, the reviewer declared, ‘that one reader in a thousand knows any particulars about “Alphonsine” and the “Female Quixote”, and is aware that Madame de Genlis is the author of the former and Mrs. Charlotte Lennox of the latter’. The refrain is repeated a few lines later when the reviewer turns to a now well-known letter in which Austen expresses incredulity that Mrs. (i.e. Jane) West was so very prolific when so domestically encumbered. West, the reviewer proclaims, is ‘but a name to the reader of this work’. Brabourne should have recognised this fact and provided relevant editorial information that the reviewer is, instead, forced to disclose. West, he interestingly continues, was ‘a voluminous writer in the last century who resembled in many things the Mrs. Meeke and Mrs. Kitty Cuthbertson’ . LM, 35 (Feb 1804): 87. Image © Adam Matthew Digital / British Library. Not to be reproduced without permission. What does this tell us? Well, for thing it suggests that if West and her works were obscure in 1885, Cuthbertson and her Gothics evidently were not. This is despite the fact that Cuthbertson never signed her name to any of her novels. And there is considerable evidence that knowledge of her fiction, although increasingly clouded in a biographical fog, persisted for at least several decades afterwards the Times review. Cuthbertson’s novels generated sufficient interest, for example, to spark conversations in Notes and Queries the 1910s and 1920s (some prompted by speculations that her work was by Radcliffe or Clara Reeve). More recent scholarship on the Gothic by Rictor Norton and others has sought to establish Cuthbertson’s place as one of the key figures of the genre in the early nineteenth century, as she surely was . It was a career that began in earnest in the pages of the Lady’s Magazine. (Some sources suggest that she wrote an earlier 1793 unpublished play staged on 25 February at Drury Lane entitled Anna but the attribution is not secure.) 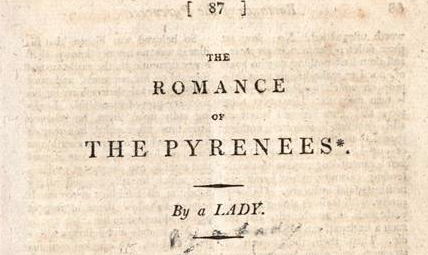 Her first novel, The Romance of the Pyrenees was serialised in the magazine from February 1804, having been recently published in volume form by Robinson (the magazine’s publisher) in 1803. However, just weeks after the title first went on sale, and after only a few copies of it had been sold, the bulk of the print run of the Romance was devastated by a warehouse fire at the establishment of the magazine’s then printer, Samuel Hamilton. Attempting to cut their losses on the damaged run, Robinson decided to serialise Cuthbertson’s novel along with their recently printed edition of Royall Tyler’s American 1797 The Algerine Captive in the Lady’s Magazine with occasional engravings. As a consequence, The Romance of the Pyrenees reached a new and possibly much wider readership than it would have done had it been published in volume form alone. It became the longest running serial magazine fiction in the long eighteenth century apart from a serialisation of Pamela . 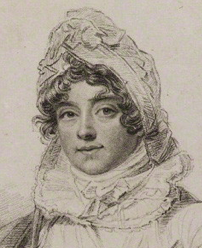 In subsequent years, the magazine would publish extracts of other of her novels (Santa Sebastino in 1807; Adelaide in 1814), all of which Robinson published, and the snippets from which seemed to serve as puffs to promote wider circulation of her work. 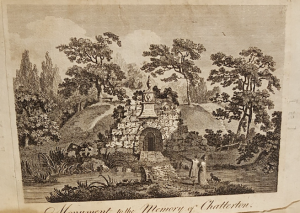 Cuthbertson’s fiction, with its complex plots and naturalised supernatural endings (my favourite involves a parrot), extends over many volumes and merits a blog post in its own right. Since reading it, however, one of my major preoccupations has been trying to find out more about its author. Although Cuthbertson was evidently popular and, at some point in the nineteenth century, revealed to be the author of her anonymous novels, her biography remains a series of speculations and lacunae. Biographical accounts suggest that Cuthbertson was born before 1780 and that she may have been Scottish or, as a likely army daughter, been born overseas. Some sources also make reference to a possible connection to a Captain Bennet Cuthbertson, who published an important work on military tactics. Armed with this scant information I was determined to find out more and with a little effort, and a few hours lost in the archives, I did. The Dublin connection, then, is what has thwarted efforts to find Catherine Cuthbertson before now. The Irish records for this period are patchy to say the least. After many hours of searching, I can find no birth or baptism notice for Catherine in the extant Irish records. But I can now prove that she was born in Ireland. Hoping that a life of penning Gothic fiction promoted good health, long-livedness and a disinclination to marry, I went in search of the Cuthbertson sisters in the 1841 and 1851 census returns. An Olivia Cuthbertson (born in Dublin) showed in the 1851 census as living, aged 85, in Ealing, Middlesex. I was disappointed that I couldn’t find a Catherine or Julia. But the Ealing connection seemed worth pursuing. What if this Olivia was Catherine’s sister? And what if the sisters had lived together or very near one another? In the 1841 census, Catherine Cuthbertson, born in Ireland, was living with a Juliana Cuthbertson. Both are listed (perhaps improbably) as 70 years old at the time (although it is theoretically possible, if unlikely, that the sisters were twins). Their source of income was the Irish Civil List, details of which subsequently confirmed for me that the sisters, along with Olivia, were living off their deceased father’s pension. I then went in search of Catherine’s death notice (occurring some time between 1841 and 1851, since she was not in the later census) and soon found a burial record indicating that she was buried in Ealing on the 2 June 1842 aged a more likely 67, dating her birth to around 1775. As attribution finds go (and we have had lots so far in the Lady’s Magazine project), this may not seem like headline news. Cuthbertson was a magazine contributor by accident not design. And although her work in the magazine and outside it was published anonymously, her authorship has long since been known and the attributions of her novels secured. Putting a (rough) birth and (more secure) death date on Cuthbertson’s life as I have been able to do might seem more like housekeeping than significant research. But I can’t help but feel that this is signficant. The Dublin connection – the fact of which made Cuthbertson’s biography so remote to us for so long – is surely of particular interest. Cuthbertson deserves the place in the history of the Gothic she is beginning to secure, but she also, I think, warrants a place in the history of Irish (women’s) writing. I hope some of my colleagues in Irish Studies will pick up this gauntlet and run with it, because Cuthbertson, quite frankly, deserves our attention. Like so many of the writers published in the Lady’s Magazine Cuthbertson’s work was influential. She was more than a Radcliffe imitator. Her work, as I hope to show in a later blog post, had formal and thematic influence and, as I have indicated, had extraordinary geographical as well as temporal reach. Her books sat alongside Austen’s in Queen Charlotte’s library, and as we have seen, it was taken for granted that readers in the 1880s would have heard of her, as they would have heard of Jane Austen, in contrast to the by then considered obscure Jane West, Charlotte Lennox and Madame de Genlis. Into the early twentieth century, people cared enough about her novels to enquire into her author’s life and work. Cuthbertson, like so many Lady’s Magazine authors, is an important figure in literary history, not just because of what she wrote, how many people fainted in her novels’ pages, or because people like Macaulay read her. She is important because her persistent popularity and claim on readers’ imaginations makes clear that so many of the things we once thought we knew about literary history – about who was read and remembered – don’t always chime with reality. Sir George Trevelyan, The Life and Letters of Lord Macaulay, 2 vols. (New York: Harper and Brothers, 1877), vol 1, pp. 129-130. 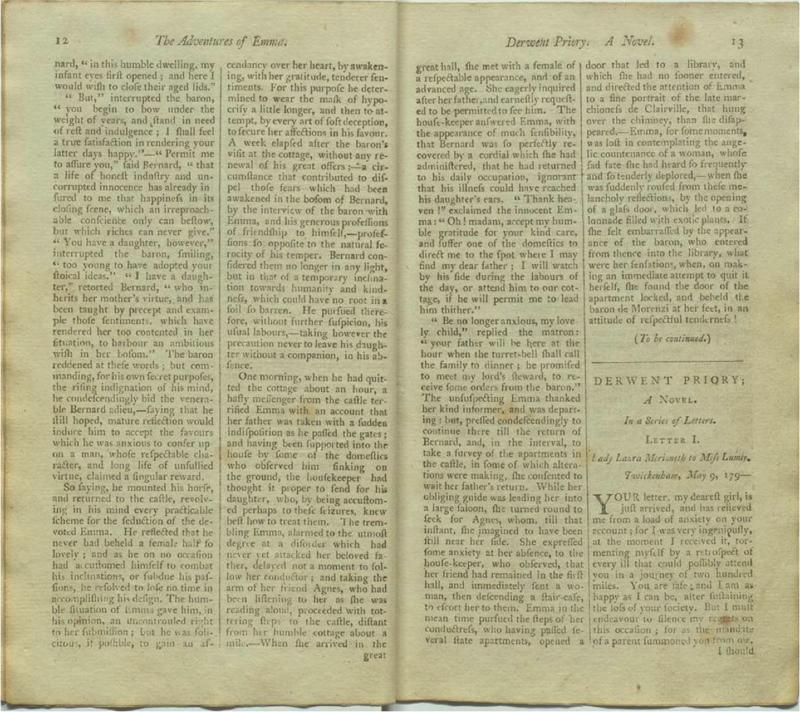 A notice for an 1812 American edition of The Forest of Montalbano appeared in the National Intelligencer for 24 March 1812, for instance. The Arkansas Gazette published a long extract of Romance of the Pyrenees on March 17 1878. ‘Jane Austen’, The Times (6 Feb 1885): 3. See, for instance, Rictor Norton ‘Gothic Readings’ <accessed 14.4.16>. William Ball Wright, ‘Note’, Notes and Queries, 77 (17 June 1911): 475. This entry was posted in Uncategorized on April 17, 2016 by ladys-magazine. It is a truth universally acknowledged – by epidemiologists, at least – that the ‘first case’ is never the first case. For example, the Duke of Richmond’s illness and death in 1819 is often said to be the first recorded case of rabies in Canada . However, not only is the nature of the Duke’s illness contested, but three much more probable cases of human rabies have come to light: Charles Gigueres (dog bite, 1814), Jean Maheu (dog bite, 1816) and Madame Bruneau (cat bite, 1817) . All of these reports predate the Duke of Richmond’s death. 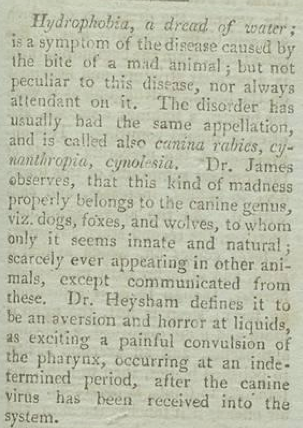 The scientific veterinary literature infers from data like these that rabies was present in Canada in pets and perhaps in wild life from at least the late eighteenth century, but the reference in the Lady’s Magazine (LM, 44 [April 1813]: 194) to the dogs running mad in Newfoundland is the first direct reference to rabies in animals in Canada of which I am aware. and died at Newstead Nov.r 18th, 1808. Assuming that Boatswain was not a recent acquisition, he contracted rabies in Britain not Canada (the incubation period of canine rabies is usually less than 6 months; range, 10 days to about 1 year). Rabies was endemic in Britain around that time. Byron is said to have nursed Boatswain without any fear of contracting the disease himself. This may not be as fantastical as it sounds; canine rabies exists in two forms: furious and dumb. In dumb rabies the dog becomes docile and may be paralyzed. An almost contemporary (1815 case date) account of dumb rabies in a Newfoundland breed dog can be found in The Veterinarian . Byron aside, by reporting the outbreak of rabies in Newfoundland in 1815, the Lady’s Magazine scored an important scientific first. Rabies is caused by a bullet shaped Lyssavirus. Viral ecotypes emerge which become adapted to and persist in particular mammalian hosts. Nevertheless, the virus can spill over into other susceptible species. For example, canine rabies causes approximately 59,000 human deaths annually . A stomach-churningly accurate description of human rabies can be found in an 1807 issue of the Lady’s Magazine (LM, 38 [March 1807]: 152–56). The average incubation period of rabies in humans is typically between one to three months (range 10 days to a year, rarely longer). Once symptoms appear, the disease in people is almost always fatal. Only 11 survivors of clinical rabies are known  and more than two thirds of these have lasting neurological damage. The author (Dr Motherby) of the article on ‘Hydrophobia’ extracted by the Lady’s Magazine recommended several prophylactic measures: these included immediate cautery of the bite wound, the application of a caustic substance to the wound or, preferably, excision (or amputation) of the wound site (LM, 38 [March 1807]: 156). Although Motherby offers no evidentiary basis for his recommendations they might well have worked. We must be careful here because not everyone bitten by an infectious animals contracts rabies (even in the absence of immediate action) and the risk of infection varies with the location of the bite, but well-regarded randomized controlled clinical trials from the 1960s demonstrated that immediate and thorough cleansing of the bite with soap (and some other substances) markedly reduces the risk of infection compared with controls , and thorough cleaning the wound is still the first of several steps in rabies prophylaxis. Dr Motherby goes on to state, that once symptoms appear, 2 grains (about 130 mg) of opium administered every 3 hours can relieve the symptoms but do ‘no more’. Other authors writing in the Lady’s Magazine were much more optimistic. In 1816, Dr Vogelsang (of Goerlitz, in Saxony) claimed to have cured Ms Joanna Rosina of Hydrophobia by bloodletting (LM, 17 [Jan 1816]: 29). Ms Rozina ‘aged 19, had been bitten by a yard dog in the foot … Four days afterwards she found herself unwell’. Dr Vogelsang, ‘opened a vein’ and took, in all, about 38 ounces (over a litre) of blood. Ms Rozina, not surprisingly, ‘fainted away’ but subsequently was ‘quite recovered’. There are at two things that tell us this was not rabies: first, the patient recovered, and, second, the incubation period of 4 days was less than half the accepted minimum incubation period for rabies in humans (Ms Rozina was also bitten in the foot which tends to result in longer incubation periods for human rabies). According to the US Centers for Disease Control, 15 to 20% of dog bite wounds become infected and at least 40 different pathogens have isolated from dog bite wounds. If the cause of Ms Rozina’s illness was an infected bite wound (plausible, but by no means certain) there are plenty of pathogens other than the rabies virus that are better candidates. Almost 25 years earlier than the article describing Dr Vogelsang’s apparent success, an anonymous contributor to the Lady’s Magazine (LM, 33 [June 1792]: 300) extolled the virtues of ‘Aurum palpabile’. He or she writes, ‘There are few political disorders in which it is not happily administered, as it generally performs a cure. The rabies patriotica (or patriotic fury) has often yielded to this remedy’. The contributor goes on to claim that it works even in very advanced cases of human rabies. Aurum potabile (sic) was a centuries old universal remedy: there is a laboured, jokey reference to it in Ben Johnson’s Volpone (‘Tis aurum palpabile, if it is not potabile’) and earlier mentions abound. For those interested in such things here is an eighteenth century recipe for drinkable gold (all metric measure are approximate). An online search revealed that there are no randomized controlled clinical trials that demonstrate the efficacy (and more importantly, the safety) of this concoction for rabies. Rabies was endemic in Britain throughout the eighteenth and nineteenth centuries . It was present in both dogs and cats. The Lady’s Magazine (LM, 14 [December 1813]: 586) reports that a servant girl in Camberwell died ‘in consequence of having been bitten by a cat, which she was chastising for some act of misconduct’. The servant died with symptoms ‘exactly similar to that perceptible in cases of the hydrophobia’. The elimination of rabies from Britain began with various legislative acts in the second half of the nineteenth century that promoted and enforced the shooting and muzzling of stray dogs and instituted draconian quarantine laws. These laws were vigorously opposed by humane societies, but rabies disappeared (temporarily) from Britain in the first few years of the twentieth century. We do not know why. Such strategies have never worked as effectively anywhere else. It is speculated that the legislation succeeded in its aim because rabies in Britain never became endemic in foxes in Britain – fox densities were just too small to maintain the virus. It is certainly true that fox hunting in the eighteenth and nineteenth centuries resulted in such a large turnover of indigenous populations that foxes had to be imported from France to bolster the ‘thinned’ populations . It would be interesting to know if contributors to the Lady’s Magazine had anything to say about foxes. J. D. Blaisdell, ‘Rabies and the Governor-General of Canada’, Veterinary History 7 (1992): 19-26. Mr Youatt, (1837) ‘Animal Pathology. 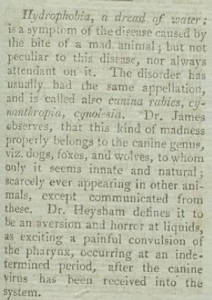 Rabies in the dog – symptoms continued’, The Veterinarian 10 (1837): 446-47. M. Netravathia, V. Udanib, R. S. Manic, V. Gadada et al. ‘Unique clinical and imaging findings in a first ever documented PCR positive rabies survival patient: A case report’, Journal of Clinical Virology 70 (2015): 83–88. D. J. Dean, G. M. Baer, and W. R. Thompson, ‘Studies on the Local Treatment of Rabies-infected Wounds’, Bulletin of the World Health Organization 28 (1963): 477–486. G. Motherby, A New Medical Dictionary (London: J. Johnson, 1775). A. N. May, The Fox-Hunting Controversy, 1781-2004: Class and Cruelty (Abingdon: Routledge, 2016). This entry was posted in Uncategorized on April 11, 2016 by ladys-magazine.